RHUEART celebrates diverse, contemporary art by established and emerging artists whose work encompasses painting, film-making, prints, photography, textiles and sculpture. We have changing exhibitions in the new gallery throughout the year alongside site-specific installations. We promote artists who are recognised in the national and international arena by organising events and participating at leading Art Fairs. In 1978 Flick and James Hawkins moved to Ullapool in the North West Highlands of Scotland and since then have been working in the Visual Arts, opening Rhue Art Gallery to the public in 1982. Flick began working with Highland Arts in 1995, a government agency set up with funding from E.R.D.F. (Europe Regional Development Fund) whose aim was to help market and promote the artists from the area. Over the years Flick has helped curate exhibitions and has shown work at Art fairs nationally and internationally, building up a close working relationship with artists from all areas of the Highlands and Islands of Scotland. When the funding finished for Highland Arts, Flick decided to utilise her expertise and contacts to develop Rhue Art into an international platform to promote and represent some of the best Artists working in the area today. 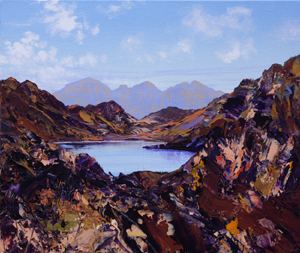 The Artists deliberately choosing to live and work in this wonderful area cannot help but have their work influenced by the environment around them, this manifests itself in many subtle ways in their artistic practice; they have a deep and powerful respect for the land, its people and culture as well as passion, skill and integrity in their approach to their art. Opening days/times: Mon-Sat 10.00 -17.00 (advisable to phone in winter).